There are many types of insects which will readily nest or feed in wood. Some of the more common insects include termites, carpenter bees and carpenter ants. There are others which are not as widely known but can do just as much if not more damage. Horntails, also known as Wood Wasps, are such an insect. Horntail Wasp on a tree trunk in early Autumn. Horntails are medium to large sized wasps which live and feed on wood. Unlike Carpenter Bees or Carpenter Ants, Horntails actually eat the very wood in which they nest. Life cycles can take a few years to complete so local infestations are sometimes not noticed until substantial damage has occurred. For this reason it is important to properly identify and treat local infestations should you suspect you have horntails living on or in any part of your home. Horntails are active in most parts of the world. They hatch from eggs which are laid in softwood such as pine, spruce or fir. However, in some cases, they can and do thrive on many types of hardwoods. Females lay eggs using their horn like ovipositor. Once they hatch, larva will feed on both the sapwood and heartwood layers of host wood (trees). Though females tend to be attracted to weakened or vulnerable trees, virtually any tree can become a target of their egg laying. Once larva start to eat, they will bore their way through several feet of wood leaving a path of pulpy sawdust or frass in the tunnels they create. This is where all the damage occurs. Once the larva get their fill, they will pupate into adults. This cycle can take 1-5 years to complete depending on local temperatures, life cycles and other weather conditions. Once pupa cocoons hatch out to the adult, they will chew their way out of the wood using their strong jaws to get through whatever is in their way. It is not uncommon to find them entering living spaces of homes as they chew their way out. It is also quite common to see them chewing through metal siding, asphalt or any other covering used over wood which is infested. It is at this point when local infestations begin to show themselves; wood which unknowingly has horntail larva or pupa is commonly used for construction since it is hard to detect these young and developing stages. However, once the pupa hatch out adults which exit the wood attempting to mate and lay eggs, it is a lot harder for the populations to remain hidden. In fact, most people notice them right away since the average person is quite frightened of any wasp! Though the adult horntails are quite noticeable and visible, they are not always the first sign which alerts the homeowner that something is active in their structure. Since woodpeckers and other types of birds can “hear” the larva as they work inside infested wood, it is not uncommon for such birds to start pecking away at the siding, molding, facia boards or any part of a structure which is harboring horntails young. They are attempting to harvest the larva, which resemble a large grub, and then consume it for their next meal. It is also quite easy to see the 1/4″ exit holes left by adults as they emerge and leave infested wood. In many cases there will be a series of holes; 10-50 is not uncommon with the average infestation. These holes will be perfectly round and can be observed in just about any type of wood. Siding, overhangs, soffits, decks, door frames, window frames, attics, basements, crawl spaces or porches are some of the more common nest sights but any part of a structure which is wood can be a likely area for an infestation. And though these holes are used as places where the adults are emerging, it is not uncommon to find adult females using these same holes to lay eggs. They do this because instinctively they know this is a fine place for their young to find food and safe harborage. When utilizing old holes for egg laying, you will expect to see adults flying in and out of existing holes as if it was some type of nest. Whether you are seeing active horntails flying in existing holes or if you have located some sections of wood which have horntail exit holes with no visible activity, there are several types of applications that can be made depending on what you are looking to accomplish. Remember, most horntail wasp infestations actually exist when the wood is harvested. For this reason it is important to understand that wood which has no evidence does not mean it is insect free. In fact, it could just mean that the larva located in the wood are still growing and feeding and have not emerged yet. Remember too that exit holes are only generated when adults leave after reaching maturity. For this reason it is important to consider all areas where specific wood was utilized. Here is an example that will help explain how important such an inspection can be. Lets say a 5 yr old house is showing exit holes on the wood used for siding. 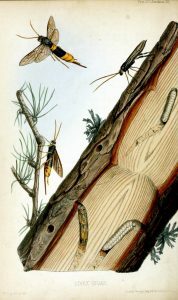 In this case, its entirely possible that larva are active on any side of the home which has the same siding installed. Contrary to this would be the house that is showing exit holes on a deck which was constructed 1 year after the house was built. If the deck was not a part of the original house, the problem will most likely be limited to the deck alone. Another example would be if you are finding exit holes in studs or joists in the attic, basement or main area of a house 3-5 years after it was constructed. Such activity would be strong evidence to support that any part of the home could have activity and that the whole structure should be treated. However, if this same house was 10 years old and new activity was being found in wood installed 3 years earlier inside as a molding, it is most likely that the infestation is limited to the wood used for molding only. These examples illustrate the need to inspect and actively identify just which wood is showing activity. Once you’ve determined if it’s original wood used to build the house or wood which was used at a later stage in the houses history, you should be ready to make a decision about what and how to treat. So lets say you have structural wood with horntail activity, you’ll need to treat it with an agent that will penetrate through and through making the wood kill anything trying to eat it. BORACARE is such a product. Boracare is a boron based product which penetrates unfinished wood and then acts as a stomach poison to any wood eating insect. Commonly used for pests like powderpost beetles, it will last for many years, is odorless and works on wood decking, rafters, floor joists and more. Boracare is thick like corn syrup but mixes with water at the rate 1:1. 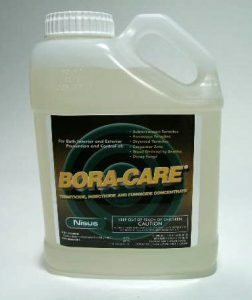 So one gallon of Boracare will make two gallons of mixed solution and will cover up to 1,000 sq/ft of wood. 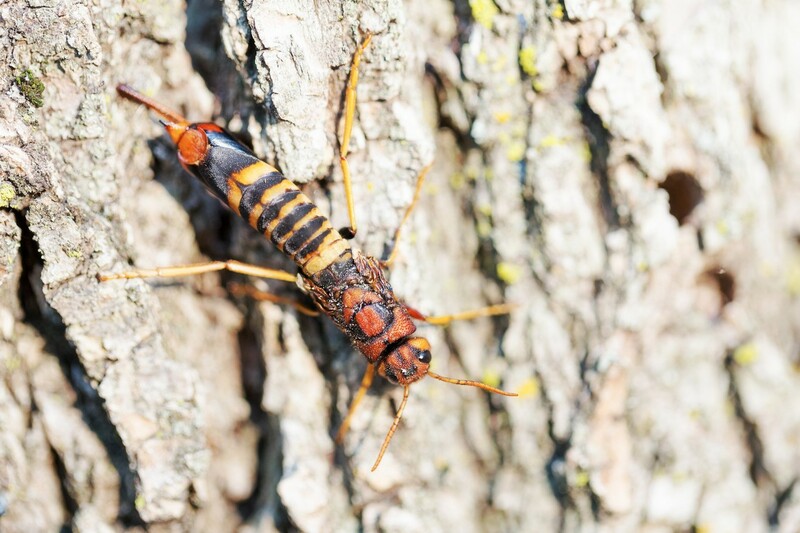 Horntail wasps will readily infest live trees. Their boring young will feed chewing galleries through the trunk which can lead to health problems for the host tree. If you have horntails emerging from an otherwise healthy tree, you should treat it make sure it stays healthy. 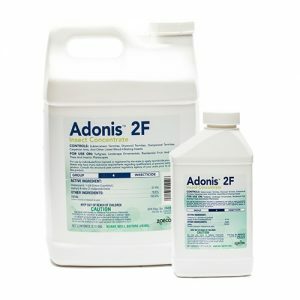 Using ADONIS as a systemic will kill off any type of boring pest like wood wasps and one treatment will last a whole year. Plan on using 1 oz of Adonis per 10 inches of tree width. To treat, get a 5 gallon pail and add 3-4 gallons of water. Next, add the 1/2 to 1 of Adonis to the water and use the entire amount by pouring it into holes you make around the trunk of the infested tree. If the tree is 20 inches wide, use two buckets each having 1 oz of Adonis and 3-4 gallons of water. The holes don’t need to be super deep, 6-10 inches is plenty, but you want them to hold the liquid to keep it in place as you pour it out from the bucket. Keep the holes inside the drip line of the tree and try to stay at least 2 feet away from the main trunk. Use a piece of rebar to make the holes or a pick axe works well too. Now if you only have 1-2 holes and you see adults using them during the day, spray some of the Adonis into the hole using some of the mixture you created for the drench. You can also spray them with PHANTOM AEROSOL. This non-repellent won’t spook them or kill them quickly but after 1-2 days, any using the nest will be dead. To protect surrounding trees from getting infested, spray their bark with CYPERMETHRIN. 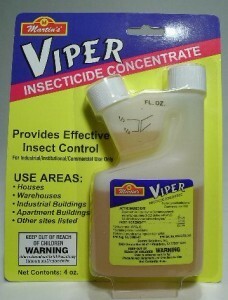 This spray is highly repellent to horntails and will keep them away. Emerging adults from one tree will be looking to either lay eggs on that same tree or any trees close by. But spraying all surrounding trees once a year with Cypermethrin will help prevent this from happening. Mix 2 oz of Cypermethrin per gallon of water and plan on spraying as much of the trunk and limbs you can reach. 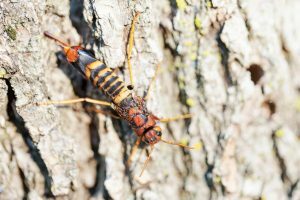 Though not commonly known as a wood eater, horntails can be a destructive pest if local infestations are left to do as they please. When you find any active in your home, be sure to do a thorough inspection and try to determine how much of the house could possibly have active populations. Use the Boracare to treat large amounts of wood which need to be protected from further damage. If you have isolated infestations, use the Drione Dust to treat exit holes and either the Wasp Freeze or the Cypermethrin to keep active adults away and under control. Be sure to monitor wood which has had activity following your applications and retreat as needed. Though easy to control, horntails can be persistent because they tend to appear where you least expect them to be living. Hello. Would any of these products work on a living tree without causing further damage to the foliage? Yes. There are two options. For active nests (trees with holes), spray Optigard. Its odorless and non repelling so they’ll continue to pass over it without caring. Optigard will take 2-3 days to kill the any which forage over the treatment but within a week, all activity will cease. Renew treatments every 2-3 months to ensure hatching pupae won’t be able to survive. Remember, nests will have developing young which can take awhile to come out so you’ll need to renew applications a few times a year to control them for the whole season. Lastly, if you want to protect other nearby trees, use Cypermethrin. 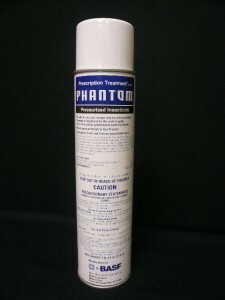 Its very repellent and treatments will last 3-6 months. Mind you this is for trees with no activity, trees you don’t want to get the wasps, so be sure to use the Optigard if there is already nests.